Last week was my last week at Bodegas La Emperatriz in Rioja Alta, Spain. I am now preparing to leave Europe and move to the North Willamette Valley of Oregon. 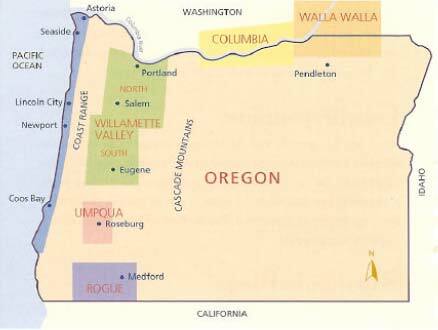 The Willamette Valley is located South, South West of Portland, Oregon and is well known for their award winning Pinot Noirs. This entry was posted in About Sacred Drop, Spanish Experiences, Winery Visits in Spain and tagged april hennig, April Yap Hennig, Bodegas La Emperatriz, Facebook, La Rioja, Oregon Experiences, Pinot noir, rioja, Sacreddrop.com, Spanish Experiences, Willamette Valley. Bookmark the permalink. Thanks girlie! I appreciate it! Una gran pérdida… lo único bueno, es que tendremos casa en Oregón!! Y tú la tendrás siempre en la Rioja!! Cuídate y mucha suerte!! Que majo eres! Te voy a echar de menos tambien mi amigo! How exciting. I live in Portland, but went to school in Yamhill County. I started to follow you based on my love of Spain, now you’re moving here. I wish you continued success. Let me know if you need any advice on where to live, etc. You should know Wines of Spain has been represented in USA ably by a local PR firm in Portland called Lane. Nice coincidence. Do you have leads on work?